The Birth of a Nation is a 1915 silent drama movie. It was directed by D. W. Griffith. It was based on the book The Clansman by Thomas Dixon, Jr. It stars Lillian Gish. The movie is about two families during the American Civil War and the Reconstruction era. The Northern Stoneman family is pro-Union. The Southern Cameron family is pro-Confederacy. The assassination of President Abraham Lincoln by John Wilkes Booth is dramatized. The movie was a great success. It was very controversial though. It showed African-American men (played by white actors in blackface) as stupid and sexually aggressive towards white women. It also showed the Ku Klux Klan as a heroic force. There were protests. The movie was banned in several cities. The outcry of racism was great. The movie is also credited in part with the formation of the "second era" Ku Klux Klan the same year. The Birth of a Nation was used as a recruiting tool for the KKK. In 1915, it was the first movie to be shown at the White House. ↑ Armstrong, Eric M. (February 26, 2010). 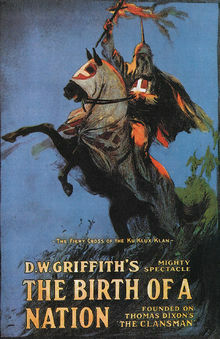 "Revered and Reviled: D.W. Griffith's 'The Birth of a Nation'". The Moving Arts Film Journal. Retrieved April 13, 2010. This page was last changed on 14 February 2019, at 21:38.